Harry Whiteman completes the Greast East Swim. There were impressive performances in and out of the pool for City of Peterborough Swimming Club (COPS) at the weekend. In the pool the club dominated the annual Cambs Cup competition in Cambridge while in a reservoir somewhere near Ipswich, Harry Whiteman was storming to victory in the Great East Swim. Harry Whiteman with his gold medal. Whiteman (16) took the honours in the ‘5k mens elite category’ at Alton Water in a time of one hour, two minutes and 17 seconds. He finished a minute clear of his nearest rival and seven minutes ahead of the third-placed swimmer. There were 171 swimmers in the race and the majority were older. And he’s certainly no stranger to open water success. He gained a podium finish in the 2016 Regional Open Water Championships to qualify for last year’s English National Championships and is on the Eastern Region Talent Pathway for potential consideration for the GB open water squad. COPS' Cambs Cup winning squad. Next step is the Great London Swim on July 1 and then two weeks later the 2017 Open Water Regional Championships where he will again be looking for a podium finish to secure entry into the British Nationals. Open Water swimming is growing in popularity and Whiteman joins a group of COPS swimmers (ages 10-17) who train at Tallington Lakes each week. In the pool Whiteman is an outstanding fly and distance swimmer, but prefers open water swimming. He said: “Part of the challenge is learning how to read the conditions. A pool is easy – you get in and swim – it is a wholly stable environment. Out in a lake you have to learn how to read weather conditions and crucially how the current is flowing. “It is impossible to train for every single variant of weather and current so you have to learn how to adapt on the day which has been a big learning curve for me. “Open Water racing is extremely tactical – learning to know when to stick in the pack and swim in the slipstream and then when to kick hard and go out. COPS had two teams in the Cambs Cup at the Cambridge Parkside Pool and they finished first and second. Match result: COPS A 238pts; COPS B 175pts; St Ives 139pts; Fenland Flyers 111pts; Ely 80pts. Right from the first race the intent was clear as Chloe Hannam (2:16:75) and Amelia Monaghan (2:21:16) gained a 1-2 for COPS in the 200m individual medley. This pattern continued with many COPS swimmers finishing at least half a length in front of the other clubs. On Saturday, the COPS mini and development squads were in action at the Regional Pool in a mini gala.They had two teams competing and they placed second and third. Match result: First Strokes 163pts; COPS Yellow 162pts; COPS Blue 153pts; South Lincs 127pts; March Marlins 105pts. 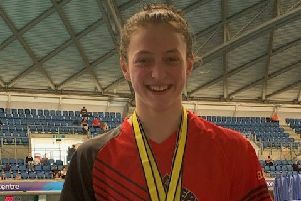 Kayleigh Elder, COPS mini squad coach and meet organiser, said: “Overall we had 10 first-time swimmers racing and over 40 personal bests were achieved which is a great testament to the strength in our mini and development squads. “Special mention should go to Rhianna Waumsley for getting an 18-second PB in the nine and Under 50m freestyle; Lucy Cushion for a five-second PB in the nine and Under 50m freestyle; Hollie Wilson for a five-second PB in the nine and Under 50m breaststroke and Gagan Singh for a seven-second PB in the 11 and Under 50m butterfly.